As my PCT thru-hike was coming closer to the end, I kept hearing more and more from other hikers about post-trail blues. At first, I didn’t think it was a thing. How could not hiking make me depressed? There were plenty of times when I was on trail and daydreamed about not having to hike for a day. The thing about thru-hiking though is it’s less about hiking and more of a lifestyle. When you spend five months of your life hiking 15-20 miles a day, sleeping in a tent, eating whenever you’re hungry, filtering water whenever you’re thirsty and living with everything you need on your back, the nomadic lifestyle becomes a habit. You crave living on the trail. Spending a day or night in town becomes weird so it makes sense why the transition period from trail life to city life isn’t easy. The morning after I got to Manning Park, the first thing I did was grab my phone and check the Guthook app. It was one of my habits I had developed over the last 153 days. It took me a minute to realize I wouldn’t be hiking out today. I didn’t have to worry about finding a water source for the next 10 or 15 miles. I didn’t have to look for a tentsite to camp at that night. I didn’t have to worry about the elevation gains for the day. I didn’t have to figure out how many miles we’d hike that day. The trail was over. We were at the end. I laid there in my warm bunk bed, kind of confused. There was a time, before hiking the PCT, when I took for granted always having access to a flush toilet, running water, a warm shower and a washer and dryer to do laundry. Having access to these things on trail was considered a luxury. I’d gotten used to digging a hole anytime I had to poop or popping a squat behind a tree anytime I had to pee. Anytime I needed water, I’d have to not only find a water source, but also had to filter the water before I could drink it and carry it with me throughout the day. Now, I could just turn on the faucet and take all the water I needed whenever I needed it. I went days without washing my hands. Instead, I would bathe myself at the end of each day in my tent using baby wipes and pack them out in my Ziploc garbage bags. Warm showers and doing a load of laundry were luxuries saved for town days. Thanks to my Dad, I had an easy introduction back into off-trail life. The day we got to Manning Park, we spent the night in a cabin with all my hiker trash friends including Grit, the French couple, Pinenut and Gourmet and FittyShrimp. The next morning, the French couple got a ride into Vancouver, we dropped Grit off at the Greyhound bus station in Hope and then dropped off FittyShrimp near the border so he could catch his bus. My Dad and I spent the rest of the day driving around, being tourists in Canada. Later that night, we decided to go to the movies. Since the movie theatre was located in an outdoor shopping center and it was a Friday night, this would be my first time being around a large group of people since I started hiking the PCT back in April. I felt a bit anxious. It was weird being around so many people and so many cars. Everyone looked so clean. Then I started thinking about clothes. Here I was, still in my hiking leggings, shorts, town shirt and town shoes (sandals), a clean and respectable town outfit I might add. Everyone else seemed very dressed up. It felt a bit excessive. I couldn’t stop thinking about how one of the first things I wanted to do when I got home was go through all of my own clothes and get rid of them. As we stood in line waiting to buy popcorn before the movie, I watched the teenagers in front of us taking selfies of themselves while waiting in line. Then the mother of the teenagers turned around to us and complained about having to wait 15 minutes in line to buy popcorn. I hadn’t realized how long we’d been waiting there. I didn’t care. I was at the movies with my Dad and not on a time schedule. Her whining made me feel really uneasy. I could see the guy behind the counter was nervous. Maybe it was his first night, working at his first job? This was my first night being back in civilization. I was probably just as nervous as he was and could relate more to him than the snatchy, impatient woman who was whining to us about how she had to wait. My first time going into a grocery store after getting off trail was really weird too. It was hard to be in a grocery store and not think about resupplying for the next section of trail. I’d have to figure out what was already in my food bag, how many days it would take me to get to the next town, how much food I’d need for the section and how much of it was I willing to carry. I had to figure out how many meals and snacks I’d need and would I be able to find something to eat I wasn’t already sick of? Now that I was in town and off trail permanently, I had to remind myself that I could go to the store whenever I wanted, whenever I was hungry and no longer had to worry about carrying the food I’d need throughout the day. I miss hiking the PCT every single day since I’ve been back home. I miss the freedom of going wherever I wanted, whenever I wanted. I enjoyed not knowing what day of the week it was. I loved not having to worry about anything other than feeding myself, making sure I had enough water and getting camp set up before it got dark out. Since I’ve been back, I’m much more aware of myself, things around me and other people’s energy. I’m way more emotional than I’ve ever been in my life. All it takes is a small trigger or a certain song to bring up a trail memory and I start crying. There’s been some cool perks with coming back to off-trail life. I enjoy and appreciate food so much more now. I learned on trail you never say no to food or water. Whenever I’ve meet up with friends, I’m fully present with them and not distracted by technology. I no longer have a half hour debate with myself at two in the morning on if I really need to get out of my warm sleeping bag and tent to go pee in the cold and dark. I can just walk a few steps to a warm bathroom. I’ve been back in civilization a little over a week now and know that post-trail blues is a thing and it’s been hitting me hard. It’s hard to focus. I’m constantly overwhelmed by the amount of choices I have to make throughout the day. Life was simple when I only had to choose between having either pork or oriental flavored ramen. I’ve yet to put away my pack and hiking gear. I still feel anxious around large groups of people. Driving makes me nervous. Even though I’m sleeping on a warm bed, I’m still sleeping in my sleeping bag. Must be a comforting mechanism. There’s a certain level of sadness that follows me around throughout the day now. I miss hiking the PCT, not only physically, but mentally. I was the best version of myself out there. I’d never been so dirty, tired and happy in all my life. As hard as this might be, I know this transition shall soon pass. I have to keep myself busy, continue to share my trail stories with anyone who wants to listen, keep in touch with my hiker trash friends and start planning the next adventure. I have loved reading about your complete journey! I’m so jealous and inspired at the same time. Thanks for following along! I still have a few more things to write about this journey over the next few weeks. I’m in the midst of planning my next adventure now so stay tuned! Love reading your stuff girl. Have read all your stories am gonna miss them when you stop. Hurry up and plan something new Iwe will be waiting to hear about it. Thanks so much for all your thorough posts. I’m not a hiker, but was so intrigued by your journey. I read Wild, and saw the movie, and loved both, probably why I enjoyed your posts so much. Thank you for following along!! Let the adventures continue. I’m just getting started. I have followed your blog since the start. It has been interesting and inspirational. I’m sorry to see your epic adventure end but at the same time so proud of you for completing the trail. Way to go. City life will get easier as time goes on, but you will always have parts of the trail and trail mentality with you for the rest of time. Thank you for following along. This trail will always be a part of me and have a special place in my heart. Not quite share about city life though. I can only imagine the post trail blues after being on the trail for 5 months.. I still have them from hiking the JMT this summer. Thru hiking can ruin a person’s life. Congratulations on completing your PCT. I am planning on my PCT thru-hike in the near future. How have you been dealing with your post-trail blues? 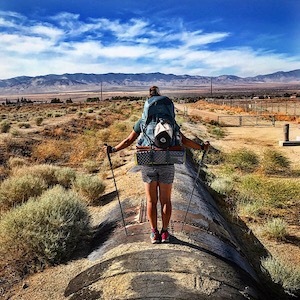 When are you planning your PCT thru-hike? 2019? Miss being around you and Grit and being uplifted by your smile and Grit’s hilarious comments. I am struggling a lot with this stuff, too, and trying to make sure I keep applying those principles I learned from life on trail to my life off trail. It’s hard with so many distractions, but I comfort myself by telling myself I have everything I need, and I don’t have to “opt back in” to any of the old neuroses or attachments or BS I left behind. Kathleen, first of all I’m so happy to hear of your successful completion of the trail so a huge congrats!! PT Annie told me about you as my husband and I did the whole of WA and much of the Sierras including parts of the SHR. Thank you for this thorough discussion of your end of trail blues. I now understand my feelings better even after a week or less even. I dream of returning, start thinking of where we can go next and how much we can fit in. We are now 70 and 69 and worry for how much longer we can do this between grandkids and other family commitments. We do wish you well on your reentry and will pray for you. And may your life commitments allow you to get back on trails lots and lots. I heard about the post-trail blues on trail and didn’t think much about it until I got off trail and felt it hit hard. I got so addicted to the trail lifestyle. I crave it everyday. Do what you can to get back out there, even if it’s just to hike a section or two. You’re never too old or busy to get out there and enjoy the beauty of the PCT. I can’t wait to get back out there myself. I’d be game to participate in something like this! Thank you! The only way I was able to afford my thru-hike was to plan and plan and save, save, save. I had to make a lot of sacrifices to put it all together, but they were all worth it to hike the PCT. I’d do it all over again. PS: There’s nothing wrong with section hiking. You’re getting out there and that’s all that counts!